The top priced ewe at the Rossiebank flock dispersal selling for 4,800gn to Mike Anderson Farming, Ballindalloch. A top price of 4,800gn was achieved at the dispersal sale of a well-established Scottish flock of pedigree Bluefaced Leicesters. The sale of Robert Neill’s Rossiebank flock, based at Broadleys, Dunning, Perth, took place at Harrison & Hetherington’s Borderway Mart in Carlisle. In his foreword to the sale catalogue Mr Neill, who founded the flock in 1973, said it was being offered for sale due to health reasons. The top price was paid for a home-bred 2016-born ewe, which stood champion at the Dumfries Show last year. She sold scanned in-lamb with triplets to Mike Anderson Farming, Ballindalloch. Next best at 3,500gn, selling to Messrs Forster & Son, Lowgate, Hexham, was a 2015-born ewe, also scanned in-lamb to triplets. Thereafter, Mike Anderson Farming paid 3,200gn for a 2016-born ewe, in-lamb with twins. Other leading prices included 3,000gn five times, with four of the lots selling to breeders in Scotland. These were: a 2015-born ewe in-lamb to twins to Messrs Quinn, Kinglassie, Lochgelly, Fife; a 2016-born ewe in-lamb to twins to Messrs Proctor & Sons, Forgue, Huntly; a ewe hogg to Messrs Baynes, Croy, Inverness; and a ram lamb, by a Burndale sire and out of the top-priced ewe in the sale, to Messrs MacNiven, Glenfarg, Perth. The other 3,000gn lot, selling to Messrs Johnson, Hamsterley, Bishop Auckland, Co Durham, was a 2015-born ewe, scanned in-lamb with a single. 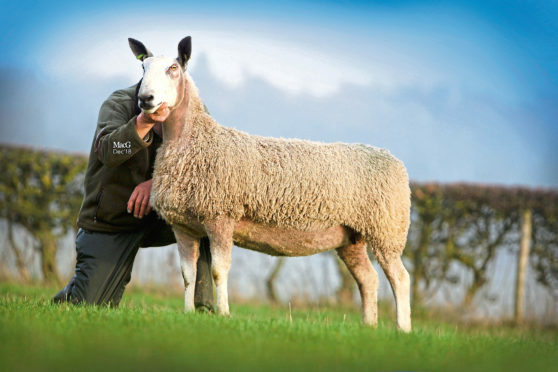 Mike Anderson Farming also paid 2,000gn for a 2015-born ewe, in-lamb to triplets, which was part of the champion pair at the Dumfries Progeny Show. He also paid 1,800gn for a ewe hogg, part of the flock’s show team, and 1,800gn for a 2016-born ram, by a Lowes Fell sire. Messrs MacNiven at Glenfarg also paid 1,600gn for a 2016-born ewe, scanned in-lamb with twins. The averages were: ewes, 53, £1,118.75; gimmers, 26, £819.18; ewe hoggs, 45, £726.37; rams, two, £2,520.